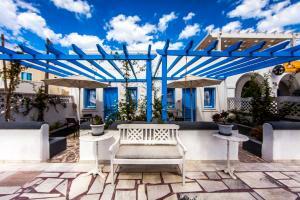 The Laokasti Villas complex is located in the beautiful town of Oia, in the north of Santorini. 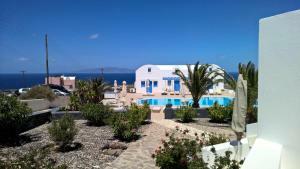 The Laokasti Villas de Oia is a traditional complex with 17 studios, apartments and villas, spacious and comfortable. 1 extra bed can be added to some room types, upon request and at an additional cost. These studios have a traditional decoration and are fully equipped. They all have a private porch with partial views of the sea, the countryside or the street. Large apartments with traditional architecture with loft. Some are next to the pool and have a private balcony with views of the sea and Ios Island. 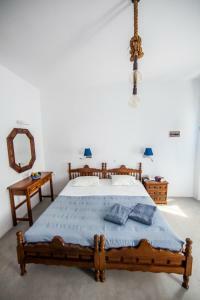 Spacious suite decorated in a traditional way and with a separate bedroom. Some have a private balcony with side views of the sea and Ios Island. This room can accommodate up to 5 guests. 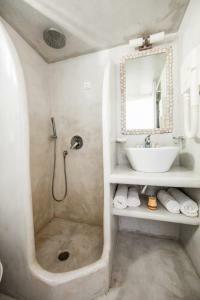 These suites are more spacious, have a traditional decoration and are fully equipped. They are located next to the pool. All have a private veranda with views of the sea, the pool and Ios Island.